Giveaway will end TODAY at 6 pm Pacific Time!! and Your Email to be able to reach you if you win! Oooh! Yay! Exciting! What a wonderful shop! This is my favorite…(I think)…it's really hard to choose!!! I love the sweetm butter pom pom trim and the red and white jester print ribbon! thanks! my email is: [email protected] , thank you ! I would choose the adorable baby pom pom in a variety of colors! What a pretty color! Thanks for the chance! What a fantastic giveaway! I was just browsing Sugar Pink Boutique and WOWEE WOW WOW!! The only thing better than her photographs is what is in the photographs! LOL. I love the German Glass Glitter and way cute satin heart ribbon but my very favorite thing in her shop is the bitty pom pom trim, IT'S SO CUTE!! wow.. such a beautiful shop! argh! if i could pick them all!!! I love her candy colored berry beads…so cute! So hard to choose! But I do love the candylights (http://sugarpinkboutique.com/item_278/Candylights-Kiwi-Sugar-Coated-5-Watt-Light-Bulb.htm)! What a great store! I found many things I liked! I'm definately going to have to put in an order there soon! Absolutely beautiful. The bubblegum grosgrain ribbon came in at a close second! What a beautiful giveaway, I think I'm in love with this shop! Thank you! I just love that color. Oh my goodness, what a fabulous giveaway!!! I love all the trims. One of my favorites is the Pink Frosting Vintage Seam Binding Ribbon!!! Oh my goodness, what a fabulous giveaway!!! I love the Pink Frosting Vintage Seam Binding Ribbon!!!! That must be my fav, tho i also love the 'german glitter' and the 'petite pom pom's' and the 'cupcake trim' and and and, they are all stunning!!!! Thanks for this chance, don't like nr1 so much, never win, but at least i got to see the shop and a real find at that!!! i really like the lilac candy light strand that would look rad in my kitchen. ooo- so many sweet finds! Cupcake Surprise Rainbow Trim would really pop a dress I;m working on for my daughter, so I'll go with it as my fav. Thought those teal poms are really calling my name! OH, so many pretty things. I love the vintage seam binding ribbon in all the fun colors. The wired tinsel is awful pretty too. How can you ask us to choose?! I want to touch all the ribbons and pompoms, but I would have to say my favorite is the Candylights Bubblegum Pink! At Christmas I have a tree dedicated to all things Barbie (I have ll but 2 ornaments made by Hallmark!) and it would be perfect with the candylights! UMM, ok what's NOT to love!? there are so many fun and cute trims. but i'm always a sucker for velvet ribbon, especially the lovely burgundy. I love the aqua lights! So many lovely things in this shop! I love the pink glass glitter and the icicle dreams bulbs. Everything is so dreamy though!! Had to show my husband all the great products. I told him "I could spend a mint on these" he reminded me "I don't have a mint!" DANG!!! Well, that certainly was hard! Picking one thing out of a ton of beautiful stuff is a hard task. So beautiful *sigh* hard to pick just one, but this would be it…. I love these flowers – so sweet and girly! I LOVE the Bubblegum Pink and Lime Green grosgrain ribbon! It's absolutely gorgeous!!!! These are the colors in my daughter's room and I'm sure I could find something to do with it! Beautiful! I think the candy colored pins are adorable!! Oh…I LOVE her shop…I would have to get some pom pom trims… a girl can never have enough pom pom trims…. Wow, thanks for introducing us to this lovely site! so many pretty pretties to pick from! Oh, that's an easy one! It's the seam binding and the little millinery flower bouquets! I like the gumball mix berry beads and the Destash of Kath Kidston Paper and envelopes. That was the hardest choice evah! I love pom pom trim and rick rack and she has soooo many choices!!! Finally I chose the purple pom pom trim. Too much to choose from. I picked the chenille ric rac, but I would have a hard time choosing my absolute favorite. http://sugarpinkboutique.com/item_73/Pretty-Cottage-Rose-Chenille-Ric-Rac-Trim.htm. Seriously, velvet ric rac, I'm a happy, happy, girl!! I'm bookmarking this website so I can go back later!! I love the Pretty Satin Pearl Pink Bows! I love the Bubble Gum Candy Lights and the Melon Bulbs…it would be a very hard to pick which to get…I just love them~! I love the Pretty Satin Pearl Pink Bows. I tried to leave a comment on your blog but It keeps looping back to sign in. Anyways thank you for the chance to win. What a great store! I ADORE the candy lights. The pink and blue ones are my favorite. They look like cotton candy. I love the ric rac and twine! I love all the products! But one of my favorites are the Candylights light bulbs (http://sugarpinkboutique.com/item_35/Candylights-Cotton-Candy-Aqua-Sugar-Coated-5-Watt-Light-Bulb.htma). Thanks for hosting such a great giveaway! Ohhhhh! I LOVE all her stuff and have been eying for months now! Thank you for the sneak peak! Hi Kathy, I've been trying to leave a comment on your blog and it's just not letting me. Tried both Firefox and Explorer. Here's my comment! 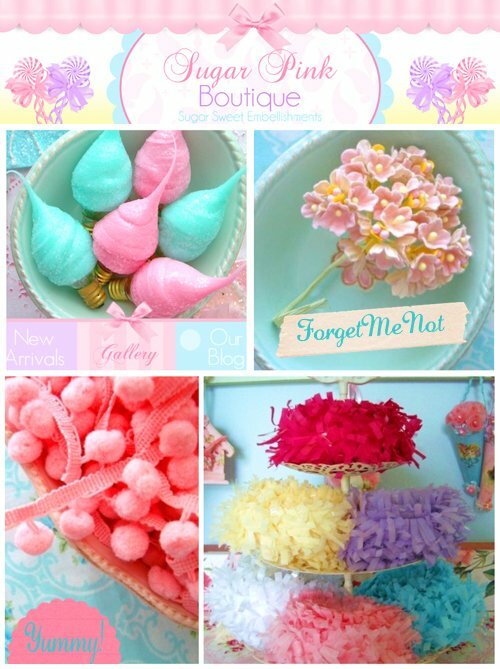 I love the candy lights, but here is what I know I'd use a lot: the cotton candy aqua and bubble gum pink twine (http://sugarpinkboutique.com/item_53/Cotton-Candy-Aqua-and-Bubblegum-Pink-Bakers-Twine.htm)…I've been wanting some of this twine forever! This shop looks so.. yummy! I'm in love with these pins: http://sugarpinkboutique.com/item_7/Candy-Color-Sparkling-Crystal-Pins.htm, but I also loooove the Cath Kidston collection! Like this – http://sugarpinkboutique.com/item_287/Cath-Kidston-Ottoman-Roses-Notebook.htm!